Nebraska basketball fans have more reason than ever to pay attention to high school basketball in the state this year, so each week Hail Varsity will be looking back at the performances by 2019 commit Akol Arop (Omaha Creighton Prep), 2020 commit Donovan Williams (Lincoln North Star) and 2021 targets Hunter Sallis (Millard North) and Chucky Hepburn (Bellevue West). The penultimate week of the regular season in high school basketball is in the books which means the postseason is almost here. Both Nebraska commits split their games last week while the two sophomores went 2-0. Arop recorded double-doubles in both of Creighton Prep’s games last week to extend his streak but the Junior Jays split two tough games against really good teams. On Friday, Prep dropped another thriller with Bellevue West 69-66 despite a big game from Arop. He finished with 22 points on 9-of-13 from the field, 3-of-5 from the free-throw line, 14 rebounds including five on the offensive end, two blocks, one assist and five turnovers. I’ll mention more about how this game played out below. 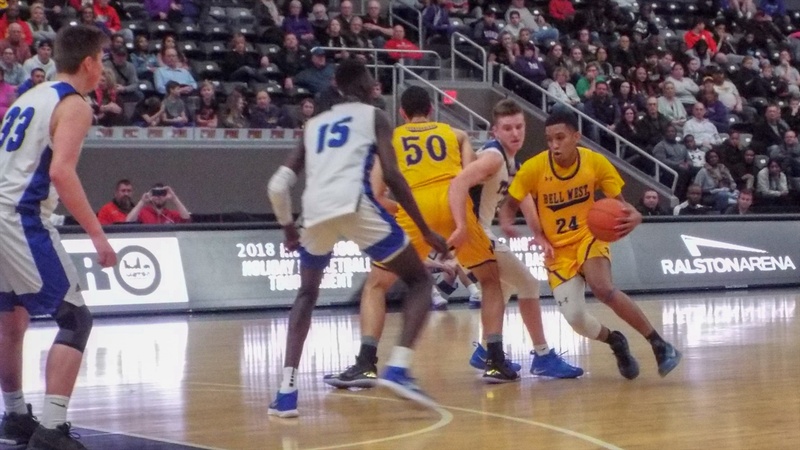 The Junior Jays traveled down to Kansas City on Saturday and bounced back with a big 65-51 win over out-of-state rival Rockhurst, handing the Hawklets their second loss of the season. Arop had 15 points on 6-of-9 from the field and 2-of-2 from the line, 10 rebounds (three offensive), four blocks, one assist and two turnovers. After shooting 0-of-8 from 3 against the Thunderbirds, junior wing Spencer Schomers went 4-for-6 and lead the Junior Jays with 16 points against Rockhurst. Arop shot 1-of-2 from 3 in both games, which is good to see. It was the first time all season he has hit a 3 in consecutive games. Creighton Prep will hold its senior day on Thursday night as the Junior Jays host Papillion-La Vista South. On Friday, Prep will head to Papillion-La Vista for the final game of the regular season. Williams put up 45 points in two games last week, but it took him 48 shots as the Navigators split their games. On Tuesday, Williams put up 25 points on 5-of-16 from the field, 2-of-11 from 3 and 12-of-18 from the line with five assists, three rebounds, one steal and four turnovers in a 78-75 win against Papillion-La Vista. On Saturday, North Star dropped its senior night game to a tough Kearney team 57-51. Williams scored 20 points but shot just 5-of-22 from the field, 2-of-11 from 3 and 8-of-14 from the free-throw line. He added five rebounds (one offensive), two steals, one assist and two turnovers to his stat line. North Star will close out the regular season with two road games this week: Thursday at Millard West and Friday at Fremont. Hepburn had a big week to lead the T-Birds to a 2-0 record as Bellevue West improved to 21-1 on the season. On Friday, Bellevue West knocked off Creighton Prep for the second time this season with a 69-66. Trailing 66-64, Hepburn banked in a go-ahead 3 and Prep turned the ball over trying to hurry up the court. Prep fouled Hepburn and he hit two free throws to seal the win. Hepburn finished with 17 points on 5-of-13 from the field, 2-of-8 from 3 and 5-of-6 from the line with 10 rebounds (three offensive), seven assists, two steals, one block and three turnovers. Elkhorn South gave Bellevue West a run for its money on Saturday but Hepburn led the Thunderbirds to a come-from-behind 75-67 win. Hepburn scored 21 of his 27 points in the second half as Bellevue West dominated the fourth quarter 32-20 after trailing by four at halftime. Hpeburn shot 9-of-18 from the field, 1-of-5 from deep and 8-of-10 from the line with four rebounds, five assists, two steals and one turnover. Bellevue West has just one game this week: senior night against Millard South. Millard North picked up two more wins last week to extend its streak to six. On Thursday, Sallis led the Mustangs with 18 points in a 75-56 win at Lincoln Northeast, shooting 8-of-11 from the field and 2-of-3 from the line with five rebounds (three offensive), three assists, three steals and one turnover. On Saturday, Millard North beat Omaha Northwest 63-53 despite Sallis struggling a bit. The sophomore finished with nine points on 2-of-6 from the field and 5-of-6 from the free-throw line with three rebounds, three steals and eight turnovers. Sallis had put together six straight games with one or fewer turnovers before that Northwest game. On Tuesday, Millard North will have its senior day against Omaha Benson. On Thursday, the Mustangs will close out the regular season at Fremont.